Linnetta, having refused several offers to dance, was catching up on society gossip. A young man–unfamiliar and handsome–approached. His exquisite demon costume, if cliche in concept, was marvelous in execution. Linnetta looked into his mesmerizing, dark eyes. He was grand, effortlessly aristocratic, putting everyone who had asked her for a dance to shame. She accepted his offer without even considering any of her stock phrases of polite refusal. floor. Linnetta’s partner followed her gaze. “I’m afraid not,” Linnetta answered. He made no further conversation, and she put the sparkling dress out of her mind and returned her concentration to her aching feet. No one’s guessed the singer/group I learned to draw gold from yet… At this point the idea of not having to color that black and white gown seems like mercy, because, ow, my hand. Put up a new poll for next week – put in a couple new suggestions, dropped the bottom three from last week. As to the singer/group, I’m going to guess a random Japanese singer: Nana Kitade. Probably not but it’s fun to guess lol. I’m loving the story along with this. Also I’m still pushing for Fairy costumes! Viva la Fairy!!! This dress is amazing! That’s really all I can come up with, I’m nearly speechless. Beautiful use of color, that black isn’t color pencil is it? WOW! That story was -stunning-! What happens next, what happens next? Who’s this young man? Please, please, please continue on. 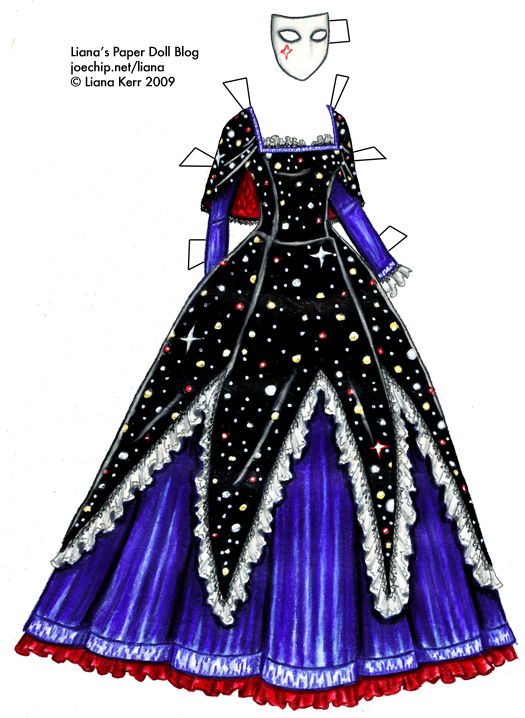 Do you also write personal fiction, in addition to drawing magnificent paper doll dresses, by any chance? Gorgeous dress! As for the singer, I’ll take Sami’s example and guess Koda Kumi. And Sami, I like Nana, too. And Liana, good story. this dress is certainly interesting, but sadly is not one of my favorites. So may I choose the colours? How about you fish out the aquamarine and do a toned down peacock colours dress with deep green accents like african-violet leaves? oh wow! i would have never guessed that! as for the dress, and the story, gorgeous! i really do hop u get this done, cause i’m more of a writer than a drawer….but ur stories r awesome! i’m sorry, idk on the fav singer! Hi Liana! I’ve been watching ur sight for about a year or more now and I’ve got to say that you excel at drawing clothes. i really like to draw myself but i am hopeless at drawing folds and such. I wondered if u might consider writing a tutorial for drawing just a basic dress or something of the sort. Again, u are an excellent artist, the Galadriel dress was my fav.